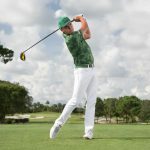 CARLSBAD, Calif. (March 27, 2019) – PUMA Golf today introduced its Union Camo Collection, a unique take on the ubiquitous camouflage trend that is sweeping the sportswear world, combined with inspiration derived from the year’s first major. PUMA’s exclusive Union Camo design layers the shapes of the United States and the state of Georgia to form its camouflage pattern that is sure to stand out. Rickie Fowler is set to wear key pieces from the collection as he heads to Augusta, Ga., in April. The Union Camo Collection, available in men’s and youth sizing, focuses on heathered textures and blocky lines to create a fashion-forward yet refined look, inspired by the memorable location of the year’s first major. IGNITE PROADAPT CAMO Shoes ($200) – The IGNITE PROADAPT, PUMA’s latest shoe introduction, employs tour-proven technologies trusted by the game’s best, designed to adapt to any lie with stability, power and comfort. Comes in a black/bronze/grey colorway. Youth P Snapback Cap ($20) – This cool, fun hat for juniors is adjustable to various head sizes and features the popular slight curve brim and 110 Snapback design in a unique PUMA Black Camo pattern. Boys Union Camo Polo ($45) – Performance polo that features an all-over Union Camo design. Available in both iconic green and neutral gray colorways. Boys Union Camo ¼ Zip ($55) – Polyester/spandex blend ¼ zip pullover that features WARMCELL technology to keep body warm in chillier temperatures. Features the Union Camo design in a neutral gray all over print. Boys Union Camo Shorts ($50) – 100% polyester, moisture wicking design keep kids looking cool and feeling cool on-and-off the course. Available in iconic green and neutral gray all over Union Camo designs. For more information on PUMA Golf’s cool new Union Camo Collection for men and boys visit www.pumagolf.com.